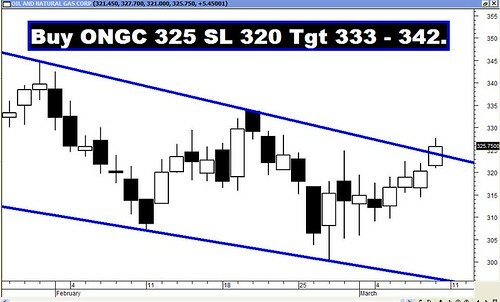 Archives : WEEKLY BULLISH ENGULFING - 08/03/2013. WEEKLY BULLISH ENGULFING – 08/03/2013. The market has bounced back smartly and the question on everyone’s lips is whether the correction is over. The way the market pulled back from the lows and almost reclaiming whatever it had lost in the last three weeks, points towards the fact that the upward rally has resumed. Also if one were to look at the Retracement levels then both Sensex and Nifty have managed to close above the 61.8% level of the fall from the top. Thus one can safely say that the upward trend has resumed. Interestingly, the Bearish Head and Shoulders pattern will stand negated if Sensex closes above 19742 and Nifty 5971. Sensex opened the week at 18920, made a high of 19706, low of 18760 and closed the week at 19683. Thus it registered a strong weekly gain of 765 points. At the same time the Nifty opened the week at 5704, made a high of 5952, low of 5663 and closed the week at 5945. Thus the Nifty went up by 226 points on a weekly basis. Both Sensex and Nifty have completed a big white body candle on the weekly charts which is forming a Bullish Engulfing pattern. This is a Bullish Reversal pattern which is engulfing last three weeks black body candle. On the daily charts too, there are three big Opening White body Marubuzo in the last four days. This speaks of the kind of Bull wave which swept through the market in the last week. Thus the daily as well as the weekly charts are showing lot of promise for the coming week. The way the market pulled back, both Sensex and Nifty have managed to close above the short term average of 20dma (Sensex – 19333 and Nifty – 5847) and the medium term average of 50dma (Sensex – 19622 and Nifty – 5942) and hence both short and medium term trends have turned bullish. Also, the indices continue to remain above the long term average of 200dma (Sensex – 18376 and Nifty – 5574). Thus the trend in the short term and medium term timeframe has turned upwards, while that in the long term timeframe continues to remain bullish. While moving higher this week, both the indices had left behind three bullish Rising gaps. If we consider the last gap between Sensex 19477-19465 and Nifty 5883-5878 to be a Measuring Gap, then the target according to Gap theory will be Sensex 20182 and Nifty 6098. If we consider the current fall from high of Sensex 20203 and Nifty 6111 to a low of Sensex 18760 and Nifty 5663, then the retracement levels for the Sensex will be 19311-19482-19652 and 5834-5887-5940 for the Nifty. Since both Sensex and Nifty have closed above 61.8% level (i.e. Sensex 19652 and Nifty 5940), one can safely say that the correction is over and the uptrend has resumed. Both Sensex and Nifty had completed a Bearish Head and Shoulders pattern two weeks back. Considering the current pull-back, if Sensex were to close above 19742 and Nifty above 5971, then this Bearish Head and Shoulders pattern will stand negated. MACD, despite being negative, has given a Buy signal on Thursday. RSI too has managed to cross the centerline from below on Thursday, resulting in a Buy signal. The ROC has managed to turn positive on Friday and has signaled a Buy. Stochastic Oscillator continues in Buy mode as %K (70) is above %D. MFI has moved higher but is still below the centerline at 47. ADX has moved higher to a level of 27, suggesting that the trend is strong. The Directional Indicators have signaled a Buy on Thursday as +DI has gone above -DI. OBV too has signaled a Buy as it has moved above the previous top. The Sell signal of Bollinger Band stands negated as the indices have managed to close above the 20dma. Majority of the oscillators have turned bullish and one can expect some more bullishness in the short term. The Nifty O.I. PCR has improved to 1.42. Highest Open interest build up is at 5700 Put and 6000 Call. This suggests that the market expects a trading range for the Nifty with support at 5700 and resistance around 6000 levels. On Friday there was very high Put writing seen at 5900 strike which suggests a short term support at that level. 6000 Call has seen some shedding of open interesting suggesting some profit booking. Open interest is increasing for 6200 Call. This suggests that if the Nifty crosses the level of 6000, then the next level will be 6200. Trendline Support for the Sensex is at 19363. Trendline Support for the Nifty is at 5858. For the week ahead, Sensex will find Support at 19413-19137-18862 and will find Resistance at 19917-20203-20461. For the week ahead, Nifty will find Support at 5853-5777-5682 and will find Resistance at 6032-6111-6185. All the recommendations given last week did well and reached their respective targets with the exception of Tata Chemicals which missed the target by a whisker. But the star performer for the week was Karnataka Bank went down by around 5%!! !